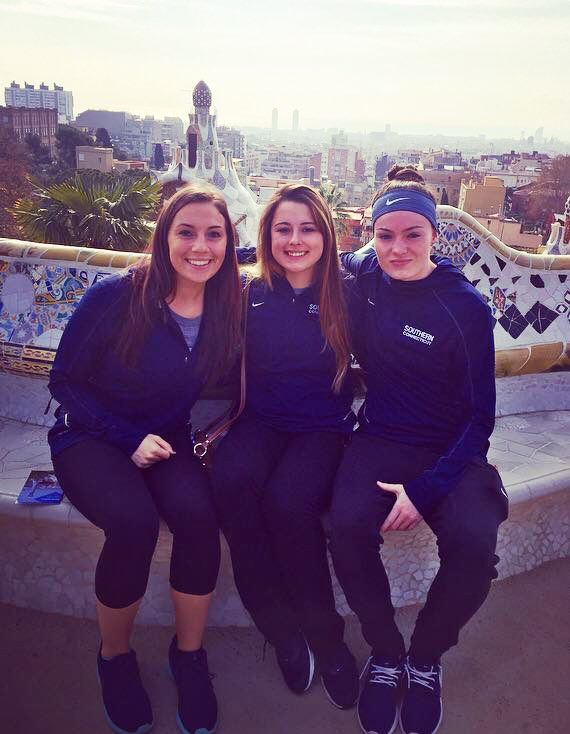 The Southern Connecticut State University women's soccer team is in the midst of a 10-day trip to Spain over spring break. Student-athletes from the squad will blog throughout the course of the journey abroad. This entry was written by Taylor Moore, Deanna Ryan and Taylor Bilyak. We started the day off bright and early to breakfast where we were still amazed by the numerous selections offered. Shortly after, we got on the bus to start our day at Park Güell, which is named after Eusebi Güell. The architecture of this building is done by none other than Antoni Gaudí who was also responsible for the design and building of La Sagrada Familia, which we were able to tour yesterday. This construction was started in 1900 and was originally supposed to be land for estates of wealthy individuals, but the lack of transport because of the exclusive nature of the area made Güell halt the project in 1914. Then after his death, the city council bought the land and it was reopened as a park a couple years after. The view from the top was one unlike any other and it was almost as if you could see all of Barcelona from the top. It had a series of paths that seemed almost prehistoric in nature and it was all uphill to get to the highest points. 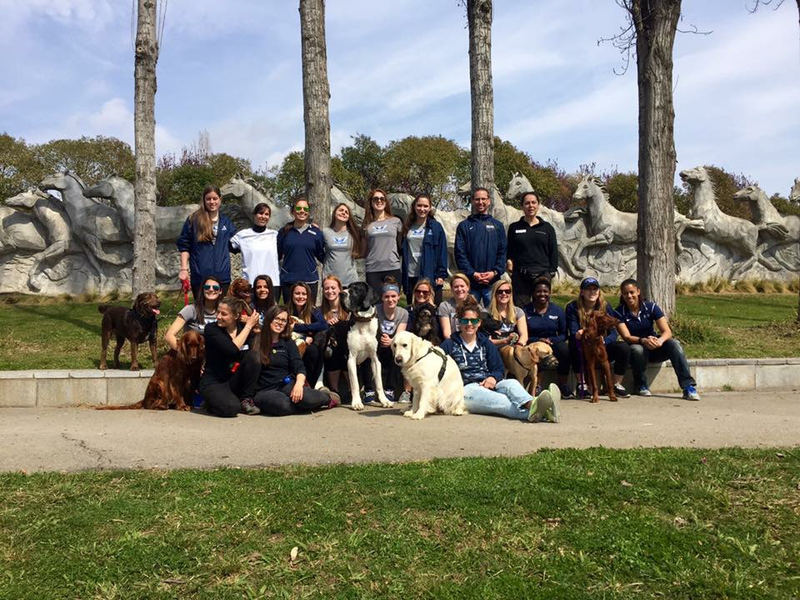 After our tour of Park Gueill, we participated in community service with therapy dogs. We were able to play with the dogs as well as learn how to train them with clickers and take them through agility obstacles, such as cones and hoops. We did team building drills with the dogs and amongst the team learned communication skills and how to work together. We also learned how many dogs are mistreated, but fortunately this foundation rescues many and gives them a better home. These therapy dogs are trained to go to hospitals, jails, help kids and many other different locations. These dogs provide a comfort for these people and are often very helpful in the recovery process. It was a great experience to learn about what therapy dogs do and the tremendous comfort they provide for people. After our community service experience, we had a short break at the hotel before our tour of Barcelona’s stadium, Camp Nou. Personally, Camp Nou has been a place we have wanted to visit for so long and the fact it was finally here was something we couldn’t fathom or put into words. The view from the field to the box seats was something we can’t even describe knowing Messi, Neymar, Suarez and Piqué control each game on this pitch. It was also a very sad day and time for Barcelona because of the loss of its very own Johan Cruyff. He not only was the creator of the famous move, but a major influence to fútbollers around the world and it was a devastating loss for everyone. Following that, we went back to the hotel for some downtime before getting Tapas at The Room for dinner, along with local beverages. There was a toast to the success of this trip and how grateful we are for the coaches and our tour guides for making this such a memorable trip. Our tables started to turn into a dance floor, so we decided to leave and go to the dance club that was arranged for us. It was called Opium and it played almost all American music, which we were very surprised about. It’s hard to think that the trip is coming to an end, but all good trips must come to an end. We are ready to enjoy our last full day and make the best out of it. This morning the team woke up around 9:30am for breakfast at the hotel. The hotel breakfast, much like the last hotel in valencia, offers a wide selection of food and includes a chef who takes personal requests. After breakfast we had a team stretch, led by Coach Katie. Groans were heard all around as we were asked to reach to our toes. Everyone was visibly sore and tight from the tough and physical game we had played the night before. After the stretch we all headed back up to our rooms, expecting to quickly get our wallets and bags and leave for shopping in downtown Barcelona. It did not go this smoothly, however, 13 of us piled into the elevator and we noticed a red flashing sign that read 800 kilograms. We had gone over the weight limit and as the elevator doors began to close, 2 of us managed to slip out. Despite our last minute effort to go under the weight limit, the doors shut and the red light remained on. 11 of us were stuck, our lives flashing before our eyes. About 8 minutes passed and we managed to pry open the doors before the fire department needed to be called to come save us. With this traumatic experience behind us, we left for downtown Barcelona. Here we were given 4 hours to walk around, shop, and eat. Most of us were loured into small tourist shops with trinkets, magnets and soccer jerseys that we had planned to get for family and friends. Our favorite store, however, had to have been Nike. We walked in with wide eyes, many of us wishing we had taken more money off of our debit cards, some of us wishing we hadn’t. It’s safe to say that Nike had a good sales day as most of us walked out with either jackets or shoes. After the Nike store we headed to the market area for lunch. The market has pretty much any kind of food you can imagine, which is perfect for our team’s wide variety of preferred tastes and foods. After eating lunch, most of us went to get the juice that can be found everywhere in the market. This is fresh fruit juice and comes in many different flavors, definitely one of the teams favorite parts of the market. After the market we headed back to our hotel and most of us took a quick nap before we got ready for our game against Sant Andreu. When we got to the field we were excited and impressed to find that it was surrounded by stadium seating. Naturally we all took out our phones and recorded videos and snapchats to show our families and friends. During the game our team was able to connect well together and play as one unit which helped us to come up with the result we were hoping for. It was a competitive game, but we were able to come out on top, with a score of 2-1 (goals from Caroline and Keri). 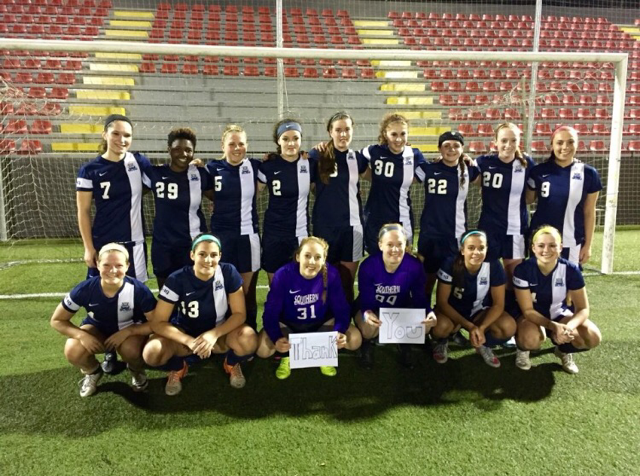 Playing against 2 Spanish teams gave our team an experience that we are all extremely grateful for. Both teams were very technical and had a style of play that we have never played against. Playing against them was not only fun, but also taught us many things about the game. After our game we went to the train station below our hotel and quickly ate dinner. I’m sure tonight we will all sleep well and wake up ready for the eventful day ahead of us. Today started out with a beautiful sun shining through our hotel window as our first day in Barcelona began. We all went downstairs to be greeted by a magnificent breakfast. This breakfast had fresh fruits, all different kinds of breads, pastries, cereals, fresh fruit juice, and even PANCAKES! While sitting down eating our breakfast we met a little boy from Florida playing in an international tournament here. He was very excited to meet us and wanted to take a picture with all of us. We all met outside following breakfast to load the bus and head towards the center of Barcelona. 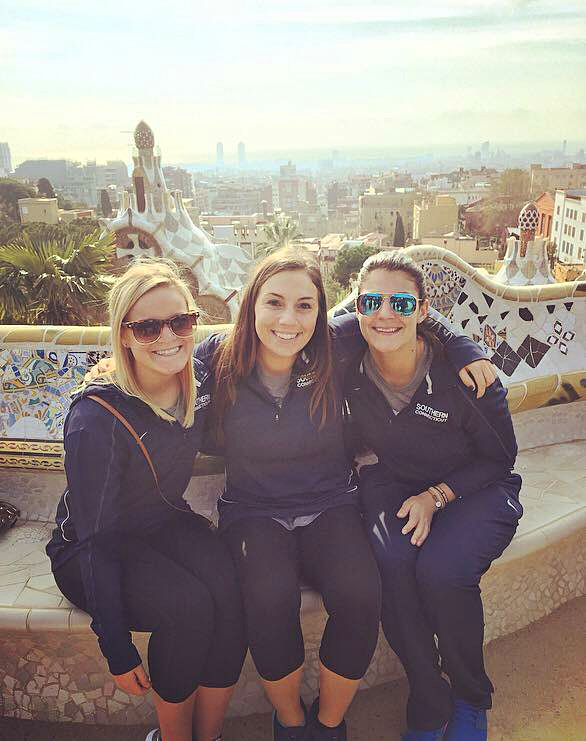 Our first stop was taking a tour of Basilica de la Sagrada Familia, which is one of the biggest attractions in Barcelona. Basilica de la Sagrada Familia is a Catholic Church built by artist Antoni Gaudi that has been under construction since 1882 and is expected to be finished by 2026. The architecture of this church was inspired by nature, which can be seen from the pillars inside the church which look like trees to show there are strong religious roots. On the outside of the church, several stories of the Bible are told through the architecture. The pictures we took at Basilica de la Sagrada Familia really do not exemplify how beautiful the church really is in person. Following our visit to Basilica de la Sagrada Familia, we headed over to a local market in search for our lunch. This market ranged from fresh meats, to fresh fruits, and empanadas. Most girls on the team got fresh fruit cups and empanadas for their lunch prior to our game. Once we finished at the market, we headed back to the hotel to rest up and get ready for our first match in Barcelona. Our game was played against Sant Gabriel. As we were on the bus headed to the game, everyone was excited to get on the field and see what the Spanish style of play was like. Before the game started we mingled with one another and Sant Gabriel gave us a banner, similar to what you see in professional international games. Sant Gabriel was very technical and quick on and off the ball, which we realized very fast. Unfortunately after a hard fought game, we came up short. Following the match we had the chance to thank Sant Gabriel and their fans for giving us this opportunity to play against them and learn from this experience. With all of us taking something away from this game, we loaded the bus to head back to the hotel where some people grabbed a quick bite for dinner. We are looking forward to an exciting day tomorrow and the opportunity to play another game. Today’s journey started with us getting together as a group for the last time in the Valencia Hotel at 11 a.m., to start our traveling day to Barcelona. 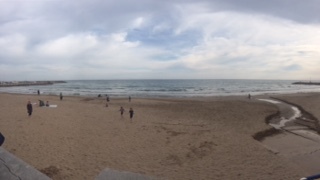 We traveled for about 3.5 hours until we arrived at Sitges for lunch and sightseeing at the beach. We spent some time walking around looking at all the stores that were on the streets and looking for a good place we could stop and have lunch. We stopped at a local restaurant and sat outside where we took in the scenery of Sitges. Many girls stopped to get different souvenirs from street vendors. There were purses, and sunglasses but as typical soccer girls, we gravitated towards the Nike sneakers. After, we headed to the beach and walked down towards the water to stick our feet in the ocean. Some girls went on the jetty to take pictures of the beautiful view that was in front of us. 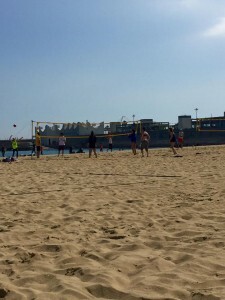 As we were walking around on the beach we met a group of English soccer players that were in Sitges for a school trip. 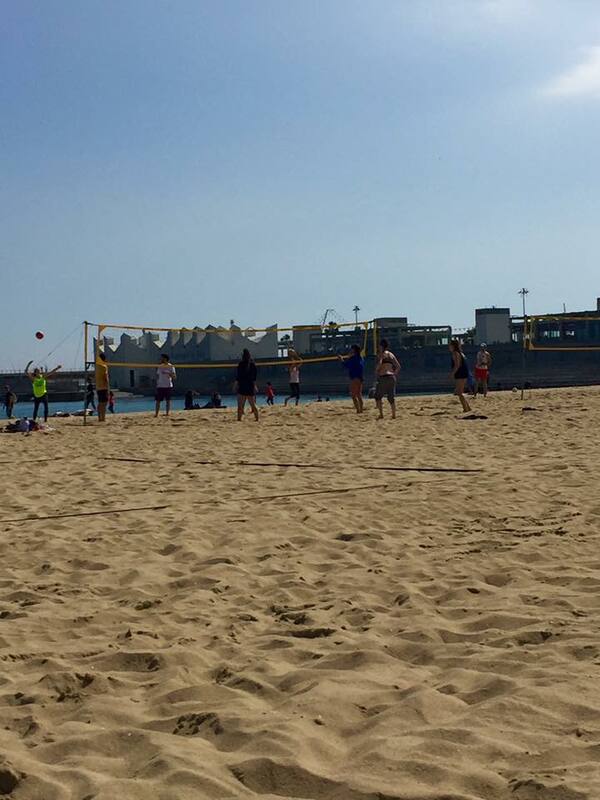 As our conversation continued, they challenged us to a game of fútbol on the beach and we accepted. Once the coaches arrived we said goodbye to our new friends and headed towards the bus. We stopped for a quick snack and got gelato. We traveled for another hour until we finally arrived in the city of Barcelona. Anticipation grew as we entered the futuristic hotel. From the moment you walk in you feel as though you are in a space shuttle. 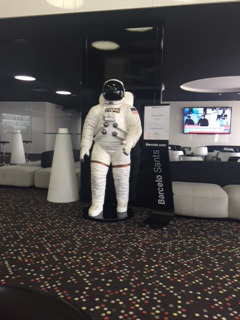 There are screens and pictures in the lobby that show what life in space would be like. The theme is modeled after the movie 2001: A Space Odyssey which came out in 1968. Once we checked in, we all headed to our new rooms and got ready for our Ethiopian themed dinner. 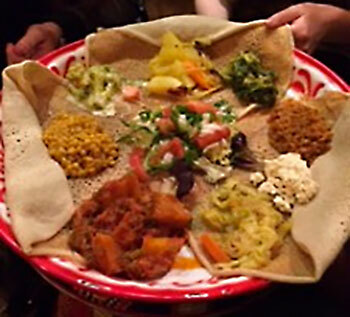 We sat low to the ground and ate with our hands like a traditional Ethiopian meal. Unlike the the previous dinners with a variety of courses, this meal included just one large main course. After finishing the delicious meal, for dessert we had a homemade chocolate brownie. After dinner we walked the streets of Barcelona back to the hotel where we had a quick team meeting to discuss the itinerary for the following day. 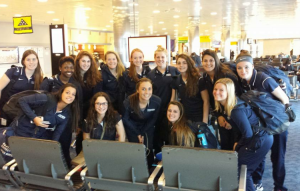 We ended the night in excitement for the next day and our first game in Spain. Today was our first full day in Valencia. We went downstairs for breakfast at the hotel and there is a distinct difference between the breakfast we had here versus a continental breakfast in America. The café con leche is to die for. It blows our minds how different even something as simple as coffee can taste. The variety of fresh fruits they had displayed beats the fruit served elsewhere. Fresh oranges, strawberries, pineapple and melons were laid out and displayed so beautifully under the breakfast bar lights. They did not have pans of the typical scrambled eggs and bacon because it is just uncommon here in Espana. What they did have was a variety of different meats, although they are not labeled, it appeared to be different types of ham and chorizo. The best part of the breakfast is the tortilla they serve here. It is omelet styled with potatoes inside and everyone on the team agrees it is by far the best part of the breakfast. It is extremely satisfying and starts you off on the right note for the day. We drove to a field a couple minutes from the hotel. The field is surrounded by apartment buildings and the atmosphere surrounding you is different than any other practice we have had. Locals stop and just sit and watch for the entire time or even watched from the balconies of their apartments. The sport of soccer, or futbol as they would call is, is so deeply loved by the community that it made us feel honored to be watched by such loving fans. After a quick shower back at the hotel, we all departed for the greatly anticipated part of the trip, the match of FC Barcelona vs Villarreal. For those who do not know, FC Barcelona is one of the most popular European teams that the greatest players currently play for. You may or may not have heard of Lionel Messi but we were on our way to watch him play and everyone was excited. The stadium, even though it is not one of the bigger ones, is like no other. Our seats had a great view of the entire field and we felt so close to the field. The fans at the match are more dedicated and crazier than any other professional game in America in our opinion. Since soccer is like a religion to the culture, the fans get so deeply invested in the matches that the atmosphere makes the game a lot more fun to watch. The match ended in a 2-2 draw but watching these players on the field was nothing we have ever seen before. Later in the evening, we went to a restaurant for dinner called La Trucha. Here we ate the popular Spanish dish called paella. They brought out a variety of different tapas before the main course and I know a lot of us were full before even the paella was brought out. When they did bring out the paella, they brought four dishes, and it was enough food to serve about fifty people. It was huge. Paella is made of rice, peppers, chicken and rabbit in a saffron sauce. Many people did not eat the rabbit because it is very uncommon in America but those who did try it said it was very delicious. The paella alone would be an experience in Spain just because of the popularity of the dish in the culture. Dinner finished around 11 o’clock and we headed back to the hotel to get ready to go out. The entire team headed to a salsa club called K-CHE. Unsure of what to expect, we went inside and were extremely surprised at the fast-paced dance moves. 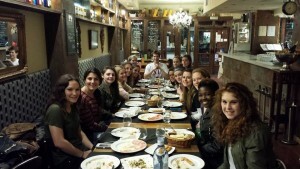 The local Spaniards loved trying to teach us how to salsa and were extremely nice—regardless of the language barrier. We are very excited to explore more of Valencia and continue learning about the amazing Spanish culture. 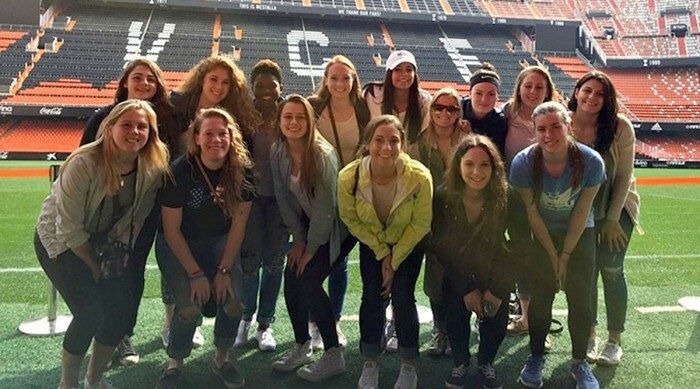 Today our team took a trip to the Valencia futbol stadium for a tour. You could imagine our excitement on the bus ride there, as we imagined what we would be able to see. It was an incredible experience to be able to walk through the locker room, out of the tunnel and on to the field; we even got to sit on the same bench that many professional footballers have sat on. In addition, we had the opportunity to see the conference rooms used for the interviews of the coaches and players. Probably the most interesting of all was learning about the history behind the club. We learned that the team colors, orange, black, and white, all had a meaning. The orange represented the famous Valencia Orange (which we must say have tasted amazing), the white referred to the first jersey of the club, and the black bat, which referred to a legend. In the story, our tour guide explained a battle in which the English were planning a night attack that Valencia was not prepared for. In the legend a bat flew into the tent and awoke the soldiers to the attack and helped them defeat the English. After the tour we spent the rest of the day in the center of the city. The only thing that we were given was a map! And with no cell phone service we were very limited. With a map and with Hannah Bodner as our human GPS we were able to navigate through the city and take in the culture. We saw unique buildings, fun shops, and the city market, which was filled with vendors selling all different types of fresh meats, spices, fruits, and other types of traditional Spanish foods! Luckily the whole team was managed to find each other for a lunch, before we separated again to go shopping and head back tot the hotel. The walk back to the hotel may not have gone as smooth. We attempted to navigate our way back to the hotel in groups of 5 with out coaches or Joey (our tour guide). After getting lost a few times and walking about an average of 10 miles we eventually found our way back. After a quick nap we were off to the lobby where coach Katie and Jackie Fede graced us with an amazing Spanish karaoke performance. On our walk there they even sang some Justin Bieber for us. After a half hour walk and almost getting locked in a park we made it to the restaurant. It was a Moroccan style restaurant which we were all a little worried about at first. However, we pushed away our skepticism and tried everything that was served to us. The food was amazing and everyone had a great time trying things we never thought we would. Many of us even thought that it was the best dinner of the trip so far. By the end of dinner, we had once again reached the topic of our curfew. Something that a lot of the players and coaches think is a sensitive topic. As we have slowly adjusted to the Spanish clock it is clear that everything here happened a lot later than back home. We were very happy with the 1:30 a.m. curfew the night before, but even that late was very early. Therefore, the team asked coach what was the latest time that we could possibly stay out. After taking the walk back to the hotel and a short speech we were given the curfew of 3 a.m. When we first heard the news, we all smiled but understood that this was a lot of trust that coach was putting into us. Of course with every plan to go out, we forgot to factor in that it was a Monday night and therefore the first few places we tried to go were not even open. We ended up taking taxi’s into the city. Let’s not forget the fact that about none of the taxi drivers spoke English, but between the 4 people in each taxi we managed to get there and back just fine. Downtown we had a blast! Everyone genuinely enjoyed being together and danced the night away! We are looking forward very much to tomorrow’s adventures! Today was a tiring, yet exciting day for the Lady Owls. We started our journey by meeting in the Moore Field House to set off to JFK with Alex Deangelo and Coach Legates, two volunteers that drove the vans back from the airport (Thank you Porter and Chris Legates!!). After a successful check-in, no time was wasted before searching for our first meal, with most choosing the classic american cuisine, McDonalds. The outlet station was taken over by our team, of course, lounging under the overhang and frequent walk-by clicks to check the percentage in which our iPhones were at. After about three hours, it was time to start boarding the plane. Any nerves about flying were quickly forgotten when we walked on the plane to realize it was equipped with personal TV screens and countless music and movie selections and Wifi. The six and a half hour flight was a breeze. Upon arriving in Spain, despite the minimal amount of hours slept on the plane, our grins were wider than we could’ve imagined they would be. We found our luggage efficiently and met our tour guide Joey, who will be with us for the rest of the trip. Several players then exchanged currency in the airport during this time. The next two hours were spent on a bus to Peníscola where we had about an hour and a half of free time to visit the castle and eat lunch. In Spain they eat lunch a bit later than us (around 1-2 p.m.). This was abundantly clear as our hungry bellies were searching for any open place to eat. As soon as we found the first open café, about 12 of us piled in. Struggling to find the words to communicate to our waitress, we managed to order our first Spanish meal. We were a little late to meet back at the bus, but it was ok because we were on Spanish time now! Another two hours were spent on our bus heading towards Valencia. Once we got to our hotel, Joey spoke a few words to the group and immediately started handing room keys out to each pair. We eagerly went to our rooms, some to find great street views, and others to find extra beds. We were then given the choice to rest before dinner or explore our new surroundings. Obviously this group chose to explore the new streets of Valencia. After changing quickly in our rooms, we met up in the lobby minutes later. We headed towards the right as Joey suggested, later to find out left was the direction we intended to go in. However, we were not disappointed when we found a local restaurant. There we tried several tapas and some local beverages. Some of the tapas included: calamari, chips and salsa (which, come to our surprise, are fries and a garlic and a ketchup type red sauce) and croquetas. Special shoutout to Victoria Conde‘s father who is the master at making these wonderful croquetas. After about an hour and a half, it was time to head back to the hotel to meet the coaches and Joey for dinner. Typically, dinner in America has an appetizer or two for the group and a main course, followed by an optional dessert. This was not the case for our first Spanish dinner. We were having tapas for our first night. Plate after plate kept being placed in front of us, never knowing which was our last. Plates included: a continuous supply of bread (Taylor Bilyak‘s personal favorite), Spanish ham, fried shrimp, eggs and black sausage, chorizo, pork, fish crépe, and a dessert dish that had chocolate cake, cream puffs, tart cake, and vanilla ice cream. Dinner was then followed by a generous homemade herbal shot meant to help with digestion, a traditional Spanish drink after a big dinner. 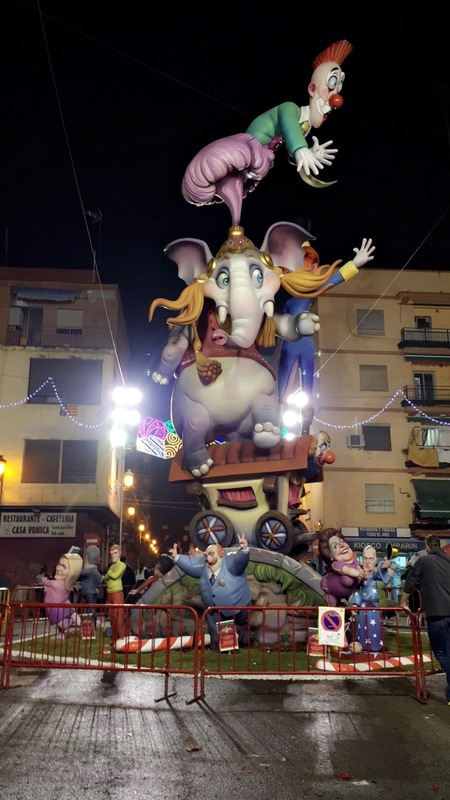 Knowing that our curfew was 11:00 p.m., we searched the streets for any sign of Las Fallas. This is a festival in Spain where groups of people spend the year creating a sculpture. On this day the sculptures are displayed and around midnight all but one are burnt. The streets are filled with fireworks throughout the entire day, and as we were able to experience, people of all ages gathered together and paraded to celebrate the festival. We were able to watch one of the statues burn, standing a bit too close at first. Ropes of fireworks were wrapped around the sculpture and as soon as the rope was lit several miniature explosions occurred, sending us jumping back in surprise and excitement. After we got to experience part of this cultural festival, we headed back to our rooms for a much needed long night of sleep. We were excited to see what day 2 had in store for us.